This article first takes a look at Siddhartha Guatama, and how he became to be known as the “Budha”, the Enlightened One. Then we look at the basic beliefs and practices of Buddhism. Around the year 563 B.C.E. in what is now Nepal, Siddhartha Guatama of the Sakyas was born the Prince of a small kingdom near the Indian border. More than twenty five hundred years later, the birth of Siddhartha Guatama is shrouded in mystery and legend. It is said that the worlds were flooded with light at his birth. That the blind so longed for a glimpse of him that they were given sight. At his birth, the deaf and mute are said to have conversed in ecstasy of what was to come. Wild animals were quiet and still. The fires of hell were quenched and prisoners freed from their chains. Only Mara, the Evil One, did not rejoice. become a Chakra-vartin , the first Universal King. If he chose instead to abandon worldly desires, he would become not a conquerer but a world redeemer. Faced with this option, the King made every attempt to keep his heir attached to the world. As the story goes, Siddharthas depression began with the Four Passing Sights. hand. It is this final sight that makes Siddhartha Guatama aware of a life lived outside the world. He no longer found any peace or satisfaction in his palace, or in the beautiful gardens that surrounded him. The dancing girls and feasts were an irritant and a distraction from his thoughts. He began to despair of ever finding real fulfillment on the physical plane if disease and death were truly inevitable. Life is subject to age and death. Where is the realm of life in which there is neither age nor death? Siddhartha Guatama was twenty nine when he went to his wifes bed chamber in the middle of the night and kissed her and their son good bye as they slept. Traveling with a palace guard he headed for the forrest arriving just after daybreak. There the Prince traded clothes with the guard who then returned to the palace to break the news. He then shaved his head and walked into the forrest on his Great Going Forth. Siddhartha Guatama of the Sakyas left the world behind. Guatamas first step was to seek out two of the foremost Hindu masters and learn all he could from them. He learned a great deal about raja yoga (designed to suit those of a scientific nature raja yoga is The Way to God through Psychophysical Exercises.) and Hindu philosophy as well. Although he was in agreement with much of the Hindu teachings, Guatama was opposed to the traditions reliance on ritual and supernatural Gods and Goddess. Guatama also found the brahmins (priests) abused their power and did nothing to assist the spiritual growth of the Hindu people. 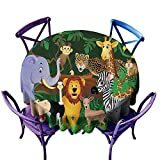 ScottDecor Zoo Summer Table Cloths Animals in The Jungle Funny Expressions Exotic Comic Cheer Natural Habitat Illustration Multicolor Tablecloth on Round Table D 54"